One would think, that with all of the attention being placed on ecology, green efforts and the reduction of carbon emissions, that we would be seeing some results of the supposed efforts in greenhouse gases. 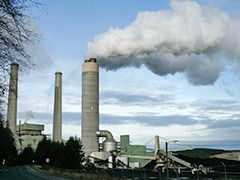 Sadly, according to a U.N. report, emissions of greenhouse gases hit an all time high in 2011. A study by WMO (World Meteorological Organization) has resulted in the report that the levels of carbon dioxide in the U.S. in 2011 rose to 339.9 ppm (parts per million) which is up two ppm’s from the 2010 levels. The shocking part about this is that it is known that carbon dioxide is the single most important contributor to greenhouse gasses. The world has watched since the 1990’s as the rise of carbon dioxide output as increased at an average rate of 1.5 ppm. The 2011 level has kept in line with the average increase per year, but, considering the focus on reduction, we should be experiencing a downtrend in pollution. The 2011 level now brings the overall increase level to thirty percent, since 1990. The WMO indicated that humans began contributing higher carbon emissions with the beginning of the industrial revolution in 1750. Half of the contributing effects were being absorbed by carbon sinks, but the natural process of carbon storage facilities such as forests and oceans cannot continue in our future. In essence, there is a maximum amount that can be processed naturally, and then it goes into overdrive. The oceans are already increasing in the acidic levels and this is affecting the underwater coral reefs and food chains. The Swiss-based U.N. agency, that uses the input data from over fifty countries, has compiled a report with details stating that there is a rise of other greenhouse gasses including nitrous oxide and methane. According to WMO, approximately 60% of the methane that is released into the atmosphere is derived from human activities such as fossil fuel exploitation, rice agriculture, farming, biomass burning and landfills. The 2011 data is showing that these concentrations achieved a new high point of 1813 ppb (parts per billion), which is 259% higher than our pre-industrial levels. Nitrous oxide emissions are contributed by human activity at 40%, 324.2 ppb, which is up one ppb from the 2010 numbers and 120% higher than our pre-industrial timeline. The message of the report is loud and clear: we aren’t doing enough to reduce carbon emissions and the implications of this affect on the planet’s well-being is a serious threat. The sad part to the story is, even if we completely halted carbon emissions right now, the planet would be in a continued state of warming due to the fact that it takes time to return to a balanced equilibrium. If we don’t take action now, we are destined for continued warming and the devastation effects that this has on weather, crops and the survival of both humans and other creatures. It is the responsibility of nations around the world to step up the reduction of gas emmissions, otherwise we will pay a heavy price. Posted on May 16th under Global Warming Issues. Mother Earth cannot absorb everything that we are doing to her. There is a natural sense of checks and balances, but we have thrown it completely off kilter by dumping so much, that she is sick and potentially dying. It’s not enough that we have done it, but too many are just turning their backs on the entire topic. As a species, we need to stand up together and agree to make changes, big ones. What does it take for those in power to sit up and admit that there is a problem? I think most of the world’s population of every day people have come to grips with the fact that carbon emissions have been and continue to cause major effects on the earth. So what do we have to do to get the politicians and big business to wake up? Have you talked to any conservatives lately? As far as they are concerned, there isn’t any problem. Weather patterns are becoming drastic, fires are destroying the land, icebergs are melting and all of this is normal. Scientific evidence on a global scale doesn’t seem to shake their opinions. The problem is – why are they making the choices for the rest of us?